What is an Accounting Worksheet? An accounting worksheet is a tool used to help bookkeepers and accountants complete the accounting cycle and prepare year-end reports like unadjusted trial balances, adjusting journal entries, adjusted trial balances, and financial statements. The accounting worksheet is essentially a spreadsheet that tracks each step of the accounting cycle. The spreadsheet typically has five sets of columns that start with the unadjusted trial balance accounts and end with the financial statements. In other words, an accounting worksheet is basically a spreadsheet that shows all of the major steps in the accounting cycle side by side. Each step lists its debits and credits with totals calculated at the bottom. Just like the trial balances, the work sheet also has a heading that consists of the company name, title of the report, and time period the report documents. 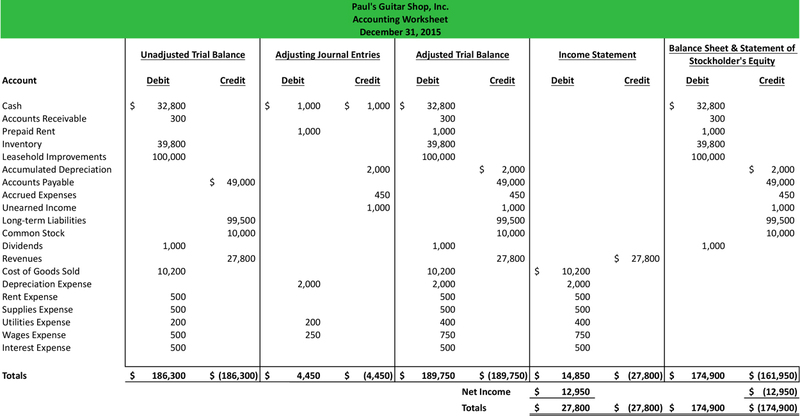 Here is what Paul’s Guitar Shop’s year-end would look like in accounting worksheet format for the accounting cycle examples in this section. As you can see, the worksheet lists all the trial balances and adjustments side by side. During the accounting cycle process, an accounting worksheet can be helpful to keep track of the different steps and reduce errors. It can also be used for a analytical and summary tool to show how accounts were originally posted to the ledger and what adjustments were made before they were presented on the financial statements. I suggest using the accounting worksheet for all your year-end accounting problems. It saves time and maintains accuracy in the process. Here is a downloadable excel version of this accounting worksheet template, so you can use it with your accounting homework. 1 What is an Accounting Worksheet?